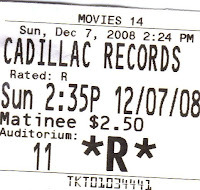 I just saw the film "Cadillac Records" and I am rating two thumbs up! The reason this film rates four stars out four is because of the characterizations seem so real. Most biopics sugarcoat reality, but this one seems to tell it like it is, warts and all. The film tells the story of Leonard Chess (Adrien Brody) and singer Muddy Waters (Jeffrey Wright) and the founding of Chess Records in Chicago. There are some standout performances, Columbus Short as Little Walter was my favorite depiction in the film, but all of the the performance were absolutely wonderful. Mos Def portrays an excellent Chuck Berry, duck walk and all. I was wondering if Beyonce could pull off a convincing Etta James and she does. Beyonce was also the executive producer of the movie. I don't want to reveal the plot, but if you enjoy musical biographies I guarantee you will love this film. thanks for the critique. I will see it based upon your review! great review, its now on my list to see! I haven't seen a lot of press on this movie. Wonder why? Anyway, your review is very much appreciated. I hating shelling out good money, especially this time of the year, only for the flick to end up a dud (smile). Glad to hear this one is worth the effort and expense. It's was well worth the price of admission, even if I would have paid full price. I looked at your movie list and we have the same taste in films, so I am pretty sure you will enjoy. Although I rarely get out to the movies, maybe I'll make an exception for this one. Also, thanks for not including any spoilers. By the way, cool idea to include your ticket stub in this post. Malcolm is real observant because I didn't even notice the movie ticket. But now that I have, I must say, you really don't need TV One if the matinees in your area are only $2.50 a pop! Good deal! I've been waiting to see this movie for a while, now, and will probably get to it this Friday. I'm glad to hear that it was enjoyable, but I'm rather curious about the accuracy, especially since many of its characters are still alive. I can't wait to see this one Pjazzypar! Great review and I am extra excited now that I know you liked it so much. I saw Muddy Waters in 1980...can you believe it? What a performer! Yes, it's me again! Had it not been for your review, I probably would have skipped this film. I caught it over the holidays and you were so right, it was EXCELLENT. Little Walter was something else, but Howling Wolf was THE MAN! (LOL). Wolf reminded me of a character in a novel I started working on a while back, but have yet to complete. After reading an excerpt, a friend told me way back then that it was "a blues novel." After watching Cadillac Records, I now truly understand what she meant and I'm inspired to jump back in and finish the manuscript. Ain't it wonderful how the universe works sometimes? (smile). Thanks for the part you played, PJ.